Countdown to Christmas with one of these DIY advent calendars. From traditional to modern designs, there are fun and grown-up calendar ideas to try this holiday season. 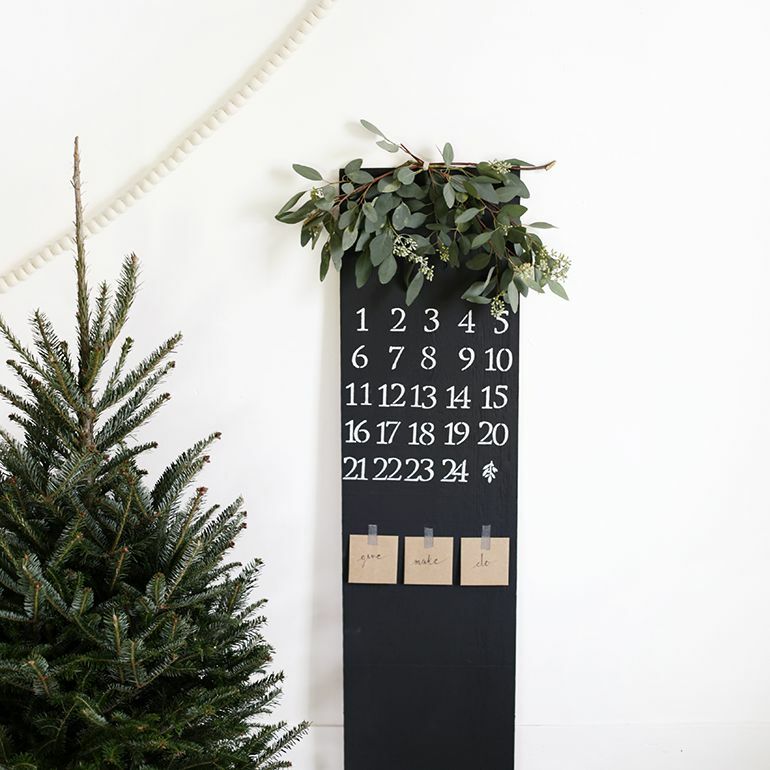 Hang this lovely DIY chalkboard advent calendar in your home that you can customize with different activities to make, do or give. Instead of the typical advent calendar countdown the days until Christmas by making huge number ornaments that say how many days there are until Christmas with this original DIY idea. Decorate 24 paper mache star boxes and string them together to create your own star garland advent calendar that you can hang in your home. Each of the small boxes can be filled with small prizes so that each day leading up to Christmas your child gets a new gift. Use mini tree stickers to decorate white paper bags for each of the days on the advent calendar. The completed bags can then be filled with a prize and hung on the wall. For an inexpensive DIY project, use paper bags to create a beautiful advent calendar for your family to enjoy opening this holiday season. Craft simple paper trees out of rolled paper and label each with a number to help your family count down to Christmas. Using a Silhouette machine cut a variety of mini houses out of paper to create an advent village to display around your home leading up to Christmas. Paint a Christmas tree on plywood and from the painted tree hang metal clips to hang sheets of paper for each day with instructions on what to do along with a photo. Hang mini chalkboard boxes that are each numbered and filled with a toy on a small tabletop Christmas tree to craft your own advent tree. Bring in the smell of pine trees into your home by hanging a pine branch, and tie small packaged gifts from the branch for your child to unwrap each day until Christmas morning. While typically advent calendars are aimed for children, this advent calendar is perfect for adults who want to make the most of the holiday season. For the 24 days until Christmas, there is an activity card of something fun to do that is Christmas themed. Get your child excited for Christmas by having them open up a small box filled with a surprise for the 24 days before Christmas. Grab a multi-pack of take out boxes and fill each box with candy or small toy and number each box to create a modern advent calendar this Christmas. Create a fun candy bonbon advent wreath using crepe paper that will add a burst of color to your holiday decor. Use toilet paper rolls to act as small boxes that can be filled with a prize and decorated with a ribbon and a number. Attach the toilet paper rolls in sequential order onto a board, and the wrapped advent calendar is an affordable way to decorate your home for Christmas. This weekend craft 24 mini birch plywood trees that can be used to form an advent calendar forest to decorate your home this holiday season. Showcase your favorite memories from the year by assembling your own Instagram advent frame so that each day leading up till Christmas you reveal a new photo. Following Christmas, you will be able to continue using the Instagram frame to easily display new photos by clipping the photos to the strings running horizontally across the frame. Decorate your home for Christmas by learning how to make these minimal advent tree boxes out of card stock in shades of green and gold to display on your coffee table. This DIY punch box advent calendar is a fun twist on the traditional advent calendar. Each day leading up till Christmas invite your child to punch through one of the 24 circles to gain access to the small toy or candy inside that section of the box.